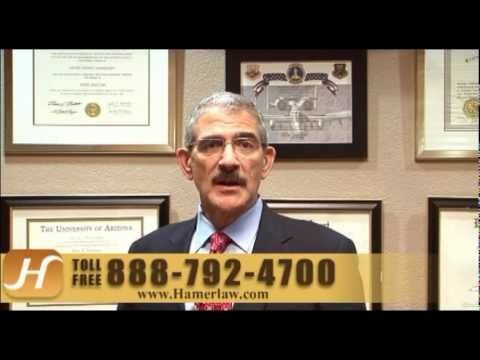 Personal Injury Attorney Tucson | The Hameroff Law Firm, P.C. It’s our passion. It’s our job. We fight for the victims of negligence in southern Arizona. For more than 25 years, The Hameroff Law Firm, P.C. has tackled the difficult cases for accident victims and those who have lost a loved one from a fatal injury caused by another’s reckless, careless, negligent or wrongful act. Our respected, experienced and accomplished legal team is personally committed to providing high-quality legal service and caring support to our clients and their families. We have substantial experience in the negotiation and litigation of personal injury cases ranging from rear-end car collisions to multimillion dollar wrongful death claims. If you need to discuss your rights and legal options with an experienced lawyer, please Contact us today at info@hamerlaw.com. We know that injured people and families who have lost a loved one want honest, straightforward answers, not a bunch of legalese. We speak your language. We can explain even the most complex cases in terms of what is important to you. We know that the better informed you are, you will be better able to make the best decisions for you and your family. When you Contact us at info@hamerlaw.com for a Free Consultations, you will work one-on-one with an experienced attorney who can answer your important questions and give you a reliable assessment of your case. If you become a client of The Hameroff Law Firm, P.C., there are no legal fees to pay until we obtain a financial settlement or jury award for you in your personal injury or wrongful death case (with the exception of legal costs). Our offices in Tucson are handicapped accessible, and there is ample free parking available for your convenience. If you are unable to travel, we will come to you. Call 520.792.4700 or 1.888.792.4700 Today for a Free Consultation.